Inspired by original Isis slot, Mega Moolah Isis one of the best video slots that take you to the land of ancient Egypt. The original Mega Moolah progressive slots game initially featured elephants, lions and other animals found in Africa. The slot also featured four Mega Moolah progressive jackpots guaranteed to be worth a million pounds, Euros or dollars. Mega Moolah is one of the most popular games in the history of a slot machine and across the world, especially in the UK. And Mega Moolah mania was initiated bowing to the rising demand. All slots casino introduced a number of sequels including Mega Moolah Summertime, Mega Moolah 5-Reel Drive and lastly Mega Moolah Isis through which Mega Moolah mania meets the magnificent culture of ancient Egypt. What is Mega Moolah Isis? 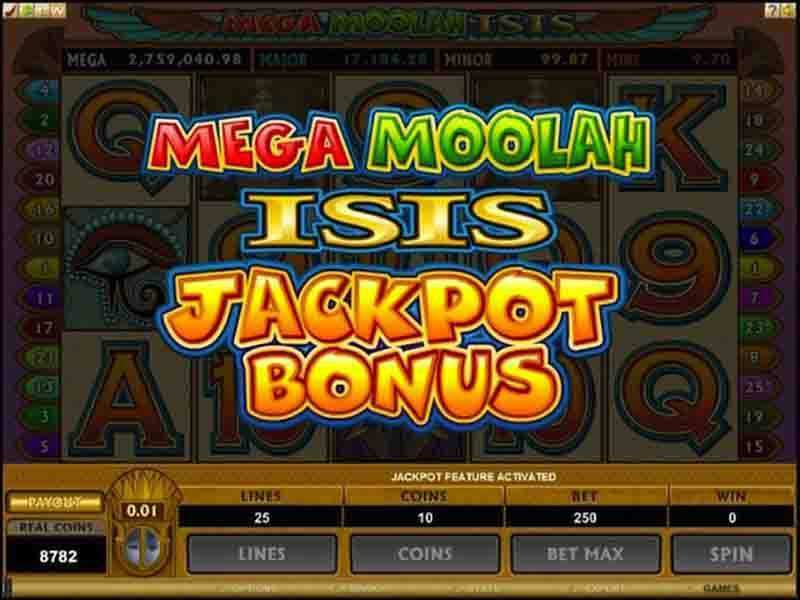 Mega Moolah Isis is an online game slot which combines spectacular specifications and pictures of Isis online slots with 4-tiered progressive Mega Moolah jackpot. And that results in an awesome hybrid that includes everything the slot maniacs want in an online slot machine. The key subject of the slot is Ancient Egypt. Along with animal-themed predecessor, it also features a progressive jackpot. It joins the increasing crowd of Egypt-themed slots and is being played over 5 reels and 25 pay lines. Followers of progressive slots are well aware that Mega Moolah is one of the greatest slots until date. It has been one of the most admired slots at Microgaming-powered casinos and now it’s joined by Mega Moolah Isis. Anybody interested in online progressive slots can play this online. Isis – the Egyptian Goddess of fertility is the wild symbol of this game can substitute for any other symbol while creating winning combinations. As Isis acts as the wild symbol to create winning pay line, can double the standard payout for that particular combination. She can act as the winning slot character on her own as well. Five Isis symbols a pay line pays out a bonanza of 10000 coins for each coin bet on the pay line. Eagle being the scatter symbol, allows five other major symbols like the Eye of Horus, a Golden Orb and A sarcophagus. There are a number of free spins if you trigger the feature by landing eagle anywhere on the reels. Every win is subject to a 6x multiplier so landing even 20 spins should make you a good chunk of profit. The progressive jackpot is randomly triggered in this slot and some player just loves this approach while some might not. You play the Wheel of Fortune game to win any of the following coin value (just the initial amount, the jackpot maximized as long as it’s not won). This makes sure you will definitely win something. There’s a number of ways to win real money at this slot even if you’re not fortunate enough to win the jackpot. Put your win on the line (not progressive wins) by clicking the ‘Gamble’ tag and play card prediction game. You can double your profit by selecting correct colors. You can also quadruple them by choosing the correct suit. This is an online slot game that requires no download. The chance of winning the progressive jackpot gets increased by upping the bet amount. So keep on doing that as long as you feel fine with the enhancement. 0 responses to "Mega Moolah Isis Slot"
2 What is Mega Moolah Isis?